Plankton include a wide variety of living organisms that range from tiny bacterioplankton to gelatinous animals like jellyfish. For most part, these organisms spend their lives drifting on ocean currents since they are unable to swim against ocean currents. As a result, they move with the currents. They are vast and diverse and thus make up a great majority of the living biomass in the ocean. Virioplankton - Studies have identified a group of viruses (virioplankton) to be a dynamic component of plankton. They are divided into bacteriophage (majority) and eukaryotic viruses. As bacteriophage, these viruses infect and reproduce by infecting bacteria in order to grow and thrive. However, to a lesser extent, they are capable of producing their own food. In their environment, virioplankton play an important role of regulating carbon as well as recycling nutrients. While most are too small to be seen with the naked eye, some like the Blue-bottles jellyfish and Moon jellyfish can be seen without the aid of a microscope. Also, it's possible to see tiny plankton move around a sample of water collected from oceans and seas. These types can also be viewed more easily by using a stereo/dissecting microscope. This simply involves placing a concentrated sample (concentration may be achieved using a centrifuge) on a plastic slide and mounting on the microscope to observe any plankton that may be present. For many others that are too small to be seen with the naked eye, other techniques can be used. 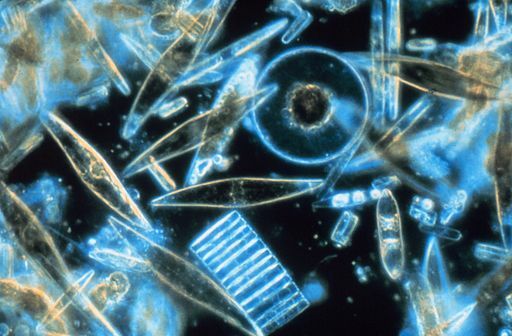 Microplankton include phytoplankton and zooplankton that measure between 20 and 200 micrometers. This includes a variety of ciliates (protistan). Using this technique, students can identify a number of organisms including dinoflagellates, diatoms as well as other ciliates. An Epi-fluorescence microscope refers to a fluorescence microscope where the specimen is illuminated from above. The arrangement of the optical components of the microscope is such that the objective serves as the source of light and also collects light from the specimen. Using this technique, it is possible to observe a number of plankton including bacteria, phytoplankton and zooplankton. Using formaldehyde, fix the sample immediately - This involves adding formaldehyde (37 percent) in to 250 ml of the sample. Using free-particle water, moisten the filter unit and place the supporting filter (1.2um) and black membrane (0.2um) on top. Under the microscope, the cells will appear to shine giving off orange and green colours. Some of the phytoplankton that may be viewed under the microscope include green algae, diatoms and dinoflagellates among others. When viewed under the microscope, the sample may reveal such zooplankton as microcrustaceans (e.g. cladoceran). 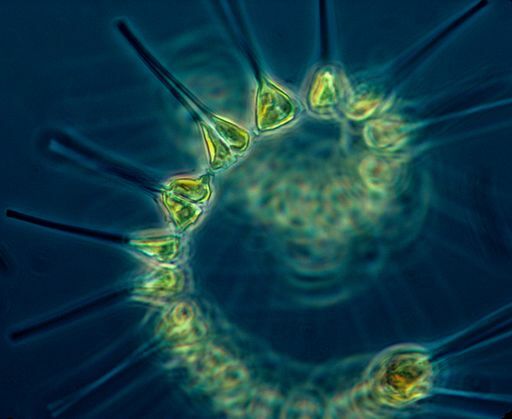 Phytoplankton may be described as free-floating microscopic plants. This is because they are tiny organisms that are capable of using carbon dioxide and sunlight to produce their own food. Like other plans that grow on land, phytoplankton have chlorophyll in their cells used for photosynthesis. This allows them to trap sunlight, which is then converted to chemical energy in the presence of carbon dioxide. Phytoplankton are very diverse and exist as both prokaryotic (e.g. cyanobacteria) and eukaryotic (algae) forms. This is a big advantage given that phytoplankton are the primary producers in aquatic bodies. However, some phytoplankton like sapromixotrophs and phagomixotrophs are classified as mixotrophs because they are not only capable of producing their own food through photosynthesis, but also obtain nutrients from organic material present in their environment. As the primary producer, phytoplankton plays a very important role in the aquatic food web. By feeding other plankton like zooplankton as well as other small fish, phytoplankton make it possible to feed other bigger aquatic organism like whales. Therefore, in the absence of phytoplankton, other higher aquatic organisms would be highly affected and even die off. Apart from their importance in the aquatic food web, phytoplankton also play a very important role in the carbon cycle. As earlier mentioned, phytoplankton use carbon dioxide for photosynthesis in order to produce food (chemical energy). In the process, some of the carbon is stored in phytoplankton when they die and settle at the bottom of the sea. Any change in the growth and amount of these organisms therefore has a direct impact on global atmospheric carbon-dioxide gas and thus on the temperature. Because they carry some of the carbon to the bottom of the ocean when they die, phytoplankton also contribute to the formation of oil. * While phytoplankton are important, they can cause diseases and even kill both marine life and people. Some of the species have been shown to produce dangerous bio-toxins that result in red tides and algal blooms. When consumed, these toxins can cause serious illnesses and even cause death. Zooplankton are a variety of minuscule animals with limited swimming abilities. As such, they are incapable of swimming against the current and thus go where the current takes them. Unlike phytoplankton that are capable of manufacturing their own food, zooplankton survive by feeding on phytoplankton since they lack chlorophyll. The different types of zooplankton can be grouped on the basis of size and how they develop. Picoplankton - Picoplankton are the smallest zooplankton that measuring less than 2 micrometers. Examples of picoplankton include Synechococcus, picoeukaryotes and Prochlorococcus. Nanoplankton - Nanoplankton may range between 2 and 20 micrometers and include such zooplankton as Pyrrophyta, Xanthophyta and Chrysophyta. Like phytoplankton, zooplankton also play an important role in the aquatic food web. By feeding primarily on phytoplankton (algae), zooplankton prevent algae from growing out of control. As already mentioned, changes in the growth of phytoplankton has a direct impact on the global carbon cycle. Therefore, by consuming phytoplankton, zooplankton also play an important role in the regulation process. 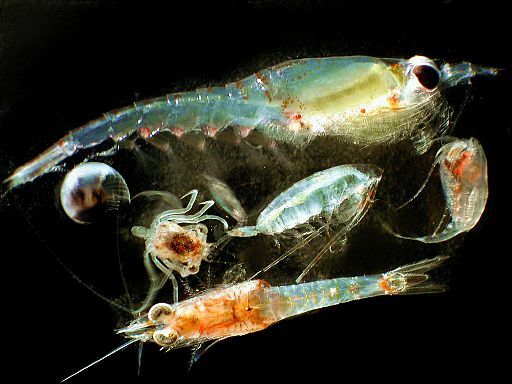 Zooplankton are also important food sources for various organisms including planktivorous fish. As such, they play an important role in aquatic food web given that their absence would affect the rest of organisms above them in the food chain. Bacterioplankton are also a group of plankton. They are primarily prokaryotic, which means that they lack a membrane bound nucleus as well as a number of other organelles. Some of the bacterioplankton like the blue-green algae are primary producers (they can synthesis their own food through photosynthesis) while others such as various heterotrophic flagellates are primary consumers and survive by consuming organism material present in their environment. Bacterioplankton has been associated with the uptake of phosphorous in water thereby playing an important role of controlling eutrophication, which can result from high phosphorous concentration. Alexandra Freibott, Lorena Linacre, and Michael R. Landry. 2014. A slide preparation technique for light microscopy analysis of ciliates preserved in acid Lugol’s fixative. Paul F. Kemp,‎ Jonathan J. Cole,‎ Barry F. Sherr,‎ Evelyn B. Sherr. 1993. Handbook of Methods in Aquatic Microbial Ecology 1st Edition.